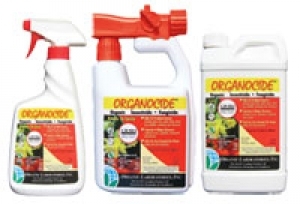 Organocide is a nature-safe insecticide and fungicide for organic production. Derived from a unique blend of soybean extract and sesame and fish oils, Organocide is heavier and more effective than other oils, but safer to the plant – even when used on hot sunny days! Organocide is one of the only products on the market that will not cause plant burn when applied on the hottest day of the year – just check the label to make sure it’s compatible with the plant you’re treating. Effective on a wide variety of insects, mites, armored and soft scales and certain fungal diseases like black spot on roses and powdery mildew, Organocide replaces many “hard” synthetic pesticides and is safe enough to spray at harvest time or indoors*. *FOR INDOOR APPLICATION, CONSUMER MUST USE THE 24-OZ READY TO USE DEODORIZED FORMULA! Organocide is a nature-safe insecticide and fungicide for organic production. Derived from a unique blend of soybean extract and sesame and fish oils, Organocide is heavier and more effective than other oils, but safer to the plant – even when used on hot sunny days! Organocide is one of the only products on the market that will not cause plant burn when applied on the hottest day of the year – just check the label to make sure it’s compatible with the plant you’re treating. Effective on a wide variety of insects, mites, armored and soft scales and certain fungal diseases like black spot on roses and powdery mildew, Organocide replaces many “hard” synthetic pesticides and is safe enough to spray at harvest time or indoors*. * No Re-Entry Time * For Organic Production * EPA-Exempt * Safer to Plants *FOR INDOOR APPLICATION, CONSUMER MUST USE THE 24-OZ READY TO USE DEODORIZED FORMULA!